6Note: I have been running a Near Zero water change since March 2015 using Triton Testing. For many years prior, water changes was the main source for trace elements only adding Kalkwasser, BRS 2 part ( for making any adjustments ), and Magnesium. All dosages are up to date as of the latest Triton results on March 8, 2017. Dosages seem to be pretty well refined for my system so no major changes made to my dosages. Mixed to 1.026 ( 35ppt ). Used for all water changes. I've used Instant Ocean for more than 10+ years. I did go through 6 X 200g buckets of Tropic Marin Pro from Apr-Dec 2012. The Tropic Marin Pro does mix much better and leaves no residues in the mixing container. Other than that, I haven't noticed any thing with the livestock. I feel I was just as successful with Instant Ocean and is nearly half the cost so I switched back. No difference in Livestock since switching. My tank does just as well with Instant Ocean. Since going to near zero water change. Use of Salt has been drastically reduced. 1 200g Box of Instant Ocean per year is the expected usage. I change about approx. 40g of water once or twice a year to clean out the sump. I find it easier to just use fresh saltwater rather than try to store and filter the sump water. I may try to find a better method of removing detritus from the sump at some point. Only other saltwater replaced from water spills, selling frags, acclimating new corals, or some type of emergency. 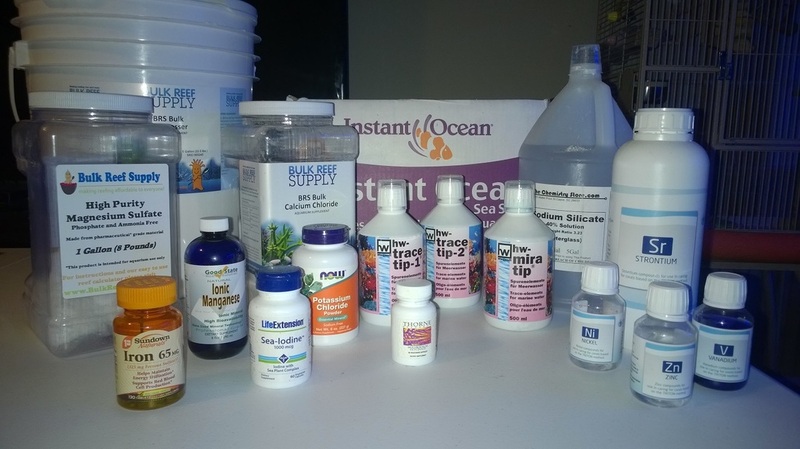 One emergency example was in Oct. 2016 when some Fenbendazole medication accidentally made it into the show tank from dipping corals and not rinsing well enough. I had to do approx 100g water change to dilute the medication. No other emergencies since going to Near Zero Water change. It is used to maintain Calcium and Alkalinity. I purchase 5 gallon buckets from BulkReefSupply at a time and usually lasts me about 15-18 months. Buying in the larger quantity and typically choosing to purchase around Holiday sales to get an additional 10% off. This makes it the same or a little bit cheaper than using Mrs. Wages. The only exception is if you can stock up on Mrs. Wages after canning season when farming stores and major discount stores clearance it off. I use the reservoir method with a 29g glass tank with glass tops but not air tight. When reservoir is near empty I add 2 cups of Kalkwasser I then add in 25+ gallons of RO/DI. No need to circulate. Just dumping in the water mixes it up sufficiently. During summertime when humidity is higher and less evaporation I may need to add up to 1000ml of Distilled white vinegar to the reservoir and 1 addition cup of kalkwasser. The Kalkwasser is then dispensed from the reservoir to the sump by a BRS 50ml dosing pump. The pump is controlled by Neptune Aquacontroller. If pH reaches at or above 8.5 dosing pump it shut off. Normally pH never reaches anything close, it is just there to prevent overdosing. The timing of how much is dispensed changes from season. 40 seconds on and approx 3 minutes off during lights OFF period. The off interval is tweaked to achieve the proper alkalinity levels. The adjustment is most typical during seasonal changes. Auto top-off is independant from kalkwasser dosing even though the majority of evaporation is replace by kalkwasser. I use two of the Randy's Magnesium recipes depending on deficiencies in Sulfate from latest Triton test. If Sulphate levels show low I use recipe #1 that is made up of Magnesium Sulfate that is purchased in bulk from BulkReefSupply. If Sulphate levels are at or above normal level I use recipe #3 which is a combination of Magnesium chloride and Magnesium Sulfate mixed in a 1 gallon container until full with RO/DI. To get this amount to dissolve and stay in solution, the ro/do water is heated to near boiling temperature. It is then dose manually depending on magnesium levels. I dose as needed to maintain 1280 ppm using Salifert test kits. Testing is only occasional ( every couple of months ) since levels do not drop dramatically since it is used in calcification at the rate of 1-3% of calcium. Notes: From Jun - Oct all Magnesium added was 100% Magnesium Sulfate. This was becuase June Triton showed a defiency of 229mg/l. Oct Triton is now back up to 1050mg/l ( Target is 900mg/l ). So for Oct - Dec will go back to Mag Recipe #1. These three are my main trace elements base. I dose 20ml daily round robin of each day. So that is roughtly 7ml of each if all were added at the same time. I find it easier just to round robin becuase the trace-tip1 and trace-tip2 can't be dosed togehter so just easier to do 1 every 3 days. This is my base for trace elements everything else it added based on Triton test individually. This is the majority of the costs. 500ml bottles of each lasts about 2.5 months and purchase at BulkReefSupply for around $55 for the set. Been using since the start of March 2015, every Triton test has never shown any accumulation or overdosing levels. So it's pretty safe in my experience when used at the recommended dosages ( or less ). Calcium Chloride is only used to increase levels in freshly mixed instant ocean. I typically add 1 cup of Randys 2 part recipe for each bag of Instant Ocean ( which mixed to approx 40 gallons ). ​I don't use calcium on regular basis. I keep it around only if need to adjust Calcium levels independantly. In most cases, kalkwasser provides the proper amount in the correct ratio to carbonate levels. I test occasionally using Salifert test kits approx. monthly. When calcium supplement is needed I use the Randys 2 part recipe. Calcium carbonate is purchased from Bulkreefsupply. Notes: 3/08/2017: When Alkalinity is a little low I used to add soda ash. Overtime though this would gradually cause calcium to need adjusted using calcium chloride. I recently started to add a Kalkwasser slurry ( 1/2 tablespoon of kalkwasser mixed with just enough water to make a thick solution and dose to a high flow area ( usually the overflow ). The hopes is this can raise Alkalinity and add some calcium to drastically reduce chloride additions. Instant Ocean contains slightly elevated potassium levels, if your doing regular water changes potassium supplement should not be necessary. However it is required in my near zero water changes. I mix up 2 8oz bottles of the Now brand potassium chloride mixed in 1 gallon of ro/di water. I now use Salifert test kit to test levels and add potassium supplement as necessary to maintain 410ppm level. Triton tests have verified that the salifert is reasonably accurate. Monthly dosage is 80mil of the strontium solution. Solution is made up of 1/3 cup of Brightwell Aquatics Dry Strontium to 1 gallon of RO/DI. Notes: 03/08/2016 Latest Triton show 6.91ppm shich is 1ppm lower than natural. Adjusted my monthly dosage from 60ml to 80ml. 10/30/2016 I switched from using Triton Sr supplement to the Brightwell Aquatics Dry Strontium supplement as a more cost effective means of maintaining Strontium. Last Triton test showed 6.49ppm natural levels are 6ppm. I follow the recommended 1 time dosages . Target is 8-12ppm . As the monthly dosage gets gradually increased I hope not to need the one time additions. ​I use Randy's recipe. Supplment is made by dissolving 1 Fergon Iron tablets in 100ml of ro/di water. I dose 5ml approx 2-3 times a week. Most tanks do not need iron supplmentation. Iron deficiency only occurs in very large refugiums setups or aglae turf scrubbers that aggressively grow algae. One of the signs of iron deficiency is when algae color shifts from green to yellow. It's pretty difficult to overdose becuase its used up so quickly. I use plant based capsules from amazon. 1 capsule thrown in the sump to dissolve per week. Last triton test reading was 17ppb target is 12ppb. Slightly elevated but close enough. Notes: 10/30/2106. MO has increased to 23ppb since last test. Will adjust to 1 capsule every other month to reduce levels. Will check again at next Triton test in Feb. I use the good sense brand purchase from amazon. Just 4 eye drops per week. It is never shown as detectable on Triton Tests. I probably could increase dosage if I wanted to. It is used primarily by phytoplankton. Mix 1/2 teaspoon of Borax in a ro/di water and add to the tank to raise boron levels by .25ppm in my tank. Notes: 03/08/2017 Tests are showing consistantly at least 1ppm low so changed to a monthly dosage instead of 1 time addition. 10/30/2016 has shown 3.77ppm target is 4.5ppm. Added 1 teaspoon to heated water. Should raise by approx 1ppm which should put be back on target. Dosage is 5ml per month. Main benefit is sponges and turnicates. However from experience I will say that this is silicate is not enough to keep the larger sponges alive. I was secretly hoping this along with vanadium would help surivival but they still die a slowly. I will not puchase sponges. I dose mainly for the hitchhiking sponges. If you overdose likely will see more algae on the glass. Triton tests have shown levels to be near perfect so dosage seems accurate. This stuff is really sticky and dose get cloudy with precipitate, add to high flow area but best not directly in the tank. The overflow is a good place. No longer dose nickel. When I did I used .5ml per month of the Triton NI supplement. Triton tests still show as undetectable. I following the triton recommended 1 time dosages after each test results which usually is around 30ml. Notes 10/30/2016. Ran out of Tr supplement. Undecided if I will continue dosing or not. I dose 1ml per month of the Triton ZN supplment. Last triton test showed 1ppb and the target is 4ppb. I follow the triton recommended 1 time dosages after each test results which is usually around 2ml. Zinc is primarily used by zooxanthellae. I dose 1ml per month of the Triton V supplement. Tests has always shown undetectable so still increasing the values. I follow the triton recommended 1 time dosages after each test result which is usually around 1ml. The only known biological reason for it is for tunicates so I'm not really concerned with accurate dosage just so long as no accumulation. Notes: 3/8/2017 Doubled the dosage from .5ml per month to 1ml since Triton test still show undetectable. ( AKA: Spectracide Stump Remover ): This is used to control phosphates in conjunction with the Algae Scrubber. The Algae scrubber keeps nitrates to non-detectable even using the high resolution mode of the Salifert Nitrate Test Kit. KN03 Solution is made using 1/2cup of the granules mixes in 1 Gallon of RO/DI. For my system ( approx. 160g water volume ), 60ml will raise the Nitrate from undetectalbe to .2-.5ppm. By the next morning nitrates will again read non-detectable. When phosphates start to drift adding KN03 solution daily can bring phosphates levels down to non-detectable on the Hanna ULR HI-736 Phosphorus checker ( reading of 1 or 0 ). This is now my preferred method of controlling phophates to levels lower than .06-.08 which seems to be about the normal levels without dosing KN03. In the past if I want to lower phosphates to levels less than .06-.08 range I would have to either reduce feeding or add 1-2 tablespoons of GFO mixed in with the weekly carbon.